For last minute gifts, some people choose to go the DIY way. I am one those people and I choose this route for two reasons. One, I do not want to go out and brave the Christmas shopping chaos of last-minute panic buyers; Two, I want the gift to be special even if it is simple, which a lot of my homemade items are. The personal touch makes the gift special. I’ve mentioned before that one staple in my country is the Christmas star or the ‘Parol’. This is a lantern made traditionally of bamboo sticks and colorful cellophane, white rice paper or Japanese paper. There are strips of paper coming from the two bottom points that represent the stars rays. The religious symbolism in this lantern comes from the star of Bethlehem that guided the Three Wise Men on their search for the baby Jesus. No home is complete without some variation of the Christmas star. One gift that is special, can be used again, symbolizes the season, and is just plain pretty is this Parol. And because of traditional simple roots, it is also easy to make at home. Make some thin sticks from a medium sized bamboo pole (fresher is better) that you might be able to find at wholesale flower markets or craft shops. If you can’t or don’t want to make these on your own, go and look for ready-made ones. They are just as good. Tie five sticks into the shape of a star and make two of these forms. Connect the ends of the stars and insert braces inside the star to make it three-dimensional. Once secure, cover this frame with your choice of paper using the strong glue. You can get fancy and add frills, cut-out paper doilies, fringes, tails, etc. and attach them to the two bottom ends. Optional: you can purchase a ready-made socket with wiring then it will be easy to put a light bulb inside your parol. Just make sure it doesn’t get too hot or the lantern could burst into flames. And, viola! You have your Parol. I think these are the perfect, whimsical, special Christmas gift to give to your friends. 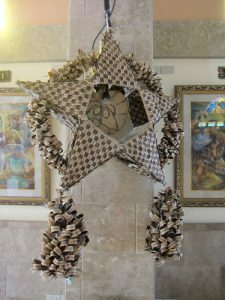 Even here in the Philippines, where the Parol is a staple, these simple homemade stars are still much appreciated. There is that added bonus that it is re-usable, cost-effective, and environment friendly. With a little effort, some materials, and a little bit of imagination, you can give that special gift. Do you make homemade gifts? What is your favorite to make?